In 1956, Malcom McLean ushered in a new era of international trade by inventing the intermodal shipping container. McLean would also unknowingly help revolutionize the field of real estate development by giving a unique blank canvas that would inspire Phillip Clark to convert these cheap and strong steel boxes into a habital building structure. Clark would be granted a patent for a series of early shipping container conversion diagrams on August 8, 1989. Shipping containers have since been used to quickly and inexpensively convert unused land to higher and better uses. Here we examine the kinds of unique structures that can be adapted from shipping containers. 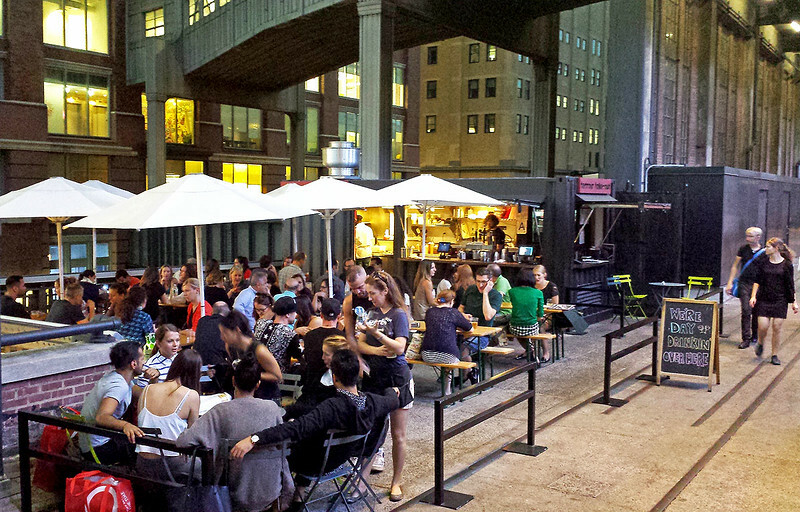 The Terroir on the Porch is a seasonal wine bar and tapas restaurant made from a shipping container situated in New York City’s High Line Park. Open may through November, Terroir on the Porch offers alfresco dining and is the only restaurant located in the expansive 1.45 mile park.